- Each set includes 10 tags measuring approximately 2 1/4 " H x 2 1/2"W.
- Your choice of a 1/8"( red, black or black & red combination) satin ribbon is attached measuring approximately 12" before it is folded. - The bag used in the photo (NOT INCLUDED) measures 8 ¼” x 5”. 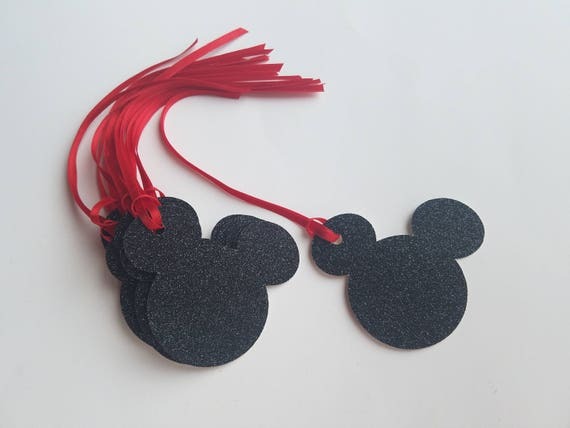 - Each tag is cut from black glitter cardstock. PLEASE NOTE THAT THEY ARE GLITTER ON ONE SIDE ONLY. WHITE ON THE OTHER SIDE. Also, it was hard to capture the glitter and shine of these tags in the photographs. They are more magical in person!